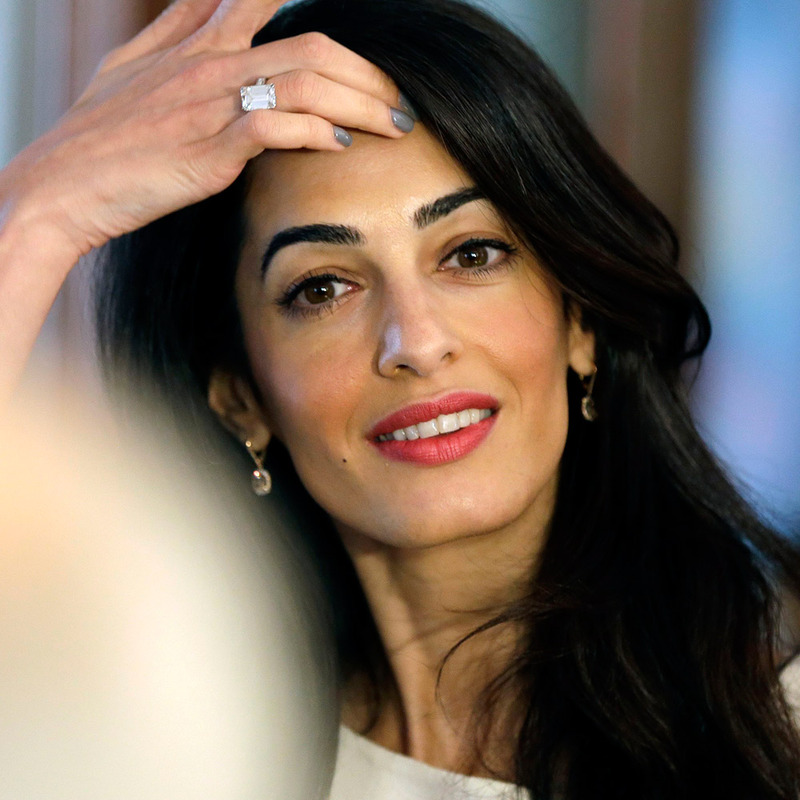 Amal Clooney stepped out in New York City on Tuesday wearing a trench coat with a twist. Instead of its usual lightweight fabric, the Alexander Wang trench coat that Amal wore is made of leather and features suede camel sleeves. I like that she’s re-wearing some of her pieces. It helps me think that her style is ‘attainable’ to some extent. Lovely to see her out and about from maternity leave. What’s the point of not publishing the prices? This is supposed be a blog about clothes. is this about you and Amal’s PR team trying to control the narrative? As I am curious, I like to see the Prices and I am proud when I guessed the Price well. Casual Observer- you are so over the top with your misplaced criticism. Why on earth would Nati control the narrative. If you want to know a price go online and find it. Well.. Nati controls the narrative because she owns this blog. The coat is gorgeous and she looks great in it. The price is on nordstrom’s website. What a different world her and her husband! A reality so far away from all of us!!! I’m clearly in the minority here. I do not like the coat at all. It looks like they ran our of material from two different coats and thought what the heck let’s use the left over pieces from two other coats and produce one coat. It’s a cool trench….but only if your looking to purely make a fashion statement….it’s definitely not practical as a coverup since if you notice it’s open in the front with just a tie in the center. At first, I really liked her trench cause it’s different, but on a closer look at the Nordstrom’s website, it isn’t too useful trench to wear since it’s open in the center and won’t really keep u warm or covered when needed. But Amal is presumably been dubbed a “fashion icon” and didn’t make her mark on the fashion world because of her good sense in style and taste. But I’d wear it if I was putting on a show for the photographers. It’s just got no practical value for the everyday professional woman, even one who can comfortably afford to buy it for 5k. Btw, I bought a burberry emerald green python trench limited edition for $8900 the year before and despite its high price, it’s quite wearable, very stylish and a lifetime keeper. I guess that’s MY idea of a great piece!! When designers are throwing things at you, hoping Ull wear one of theirs, u don’t need to have sensible philosophy that the practical yet stylish woman has. You don’t need to be that selective about what your wearing today since it will be something else tomorrow, since you’re getting the clothes for free, and sometimes even being PAID to wear them for FREE,.You’ll probably only wear it once, rarely twice. Amal’s trench is also available at Saks online. Soos- If you are in high school you need to take courses to learn the English language — how to read, how to understand the words used in sentences, and basic comprehension. You are so angry that you did not carefully read what I wrote regarding the coat. It is now almost laughable to read your responses to me because they are utter nonsense. And if Nati wants to post prices she will. It is not a requirement of her blog. Go onto Google and type in the item and prices will come up regardless of where the item is sold. It takes about 5 seconds. I agree with you, Jackson. Not keen on the coat, it screams ‘fashion victim’. Love the D&G shades though. Not a single glance or word to the bodyguard. No even a thank you. I wouldn’t be able to do that. Anytime an employee opens a door for me I can’t help. So it raises questions in my mind about the couple’s simplicity and humanity…I find her rather pretentious. Way too much leather this go around. Blue leather trench, black leather trench, brown leather trench… Black lizard purse. Too much leather, suede, lizard, and fur collar. The DVF is in pvc faux leather . But I agree with you.